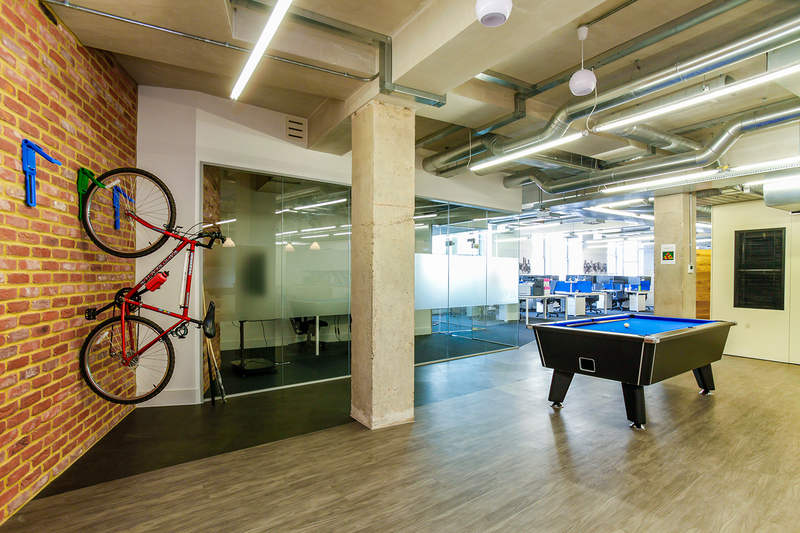 We take a look at some of the UK’s coolest offices. The design teams didn’t just think about combining practicality with cool design features, they used the brand identity of their client to inform their decision making process. Whether your client has given you a brief of industrial design, or they want something bright and colourful, we appreciate designing a workspace that’s both practical and morale boosting for the employees can throw up plenty of challenges. These projects might inspire you. A look at the UK’s coolest offices to inspire you. When you have a giant slide in your office, it stands to reason that it’s going to be one of the coolest in the UK. Red Bull have outdone themselves with their London office, featuring everything from a social hub to meeting areas with a difference. The expansive workspace, which covers 1860 square meters over three floors, effortlessly encapsulates what the modern office is all about. It’s open whilst at the same time being connected and efficient, which makes for a dynamic overall impression. Everything about the top floor of the office has been designed to encourage interaction between the employees, with its features almost stitched together by a carbon fibre element that snakes throughout. The snaking carbon fibre element has been designed with the company’s core principle of embracing extreme sports in mind, meaning wherever you turn, you’re never too far away from Red Bull’s brand values. You wouldn’t exactly expect Auto Trader to have one of the UK’s coolest offices, but if you head to Manchester, you’ll soon discover why they deserve to be on this list. The digital site that allows users to buy and sell cars has everything in their offices from touch screen walls which allow employees to capture their ideas, to break out zones complete with pool tables and video games. There’s even a relaxing ski lodge, and if none of the 38 meeting rooms are free, staff can always schedule a gathering in a converted VW camper van. Modern, adventurous and above all else fun, Auto Trader’s adventurous playground can’t help but encourage creativity. One of the pioneers of the ‘cool office’, Innocent’s Fruit Towers in London is a colourful and inspirational space that has been capturing the imagination of its employees since its completion in 2011. With artificial turf which crunches underfoot throughout the offices adding floor definition, Innocent have created an indoor paradise in the heart of London. With everything from beautifully bright meeting rooms, to a double height canteen which brings the outdoors inside through park benches and bunting, Fruit Towers is probably about as far removed from a bland office as possible. As an innovation agency, you’d expect AKQA to think outside the box for their office design, and that’s exactly what they have done. Fans of industrial chic will feel right at home in the AKQA offices which reference London’s historic dockyards and warehouses. The textured space features a huge amount of custom made furnishings, creating a truly unique working environment. Exposed brickwork, steel beams, railway sleepers and Georgian wired glass are just some of the features that contribute to the industrial factory aesthetic. The genius of the office design, however, doesn’t come from the fact it successfully pays homage to London’s industrial past, but the fact it manages to do so whilst still retaining an element of luxury.